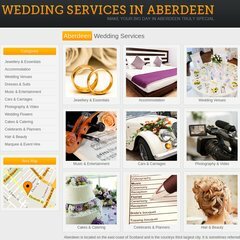 Topics: Wedding Venues, Dresses, Suits And Kilts, Rings And Jewellery, Cars And Carriages, and Allison's Kilt Hire. The programming language environment is PHP/5.2.6. There are 2 Nameservers, ns2.vreglobalserver1.co.uk, and ns1.vreglobalserver1.co.uk. It is hosted by Rapidswitch Ltd (England, Maidenhead,) using Apache/2 web server. PING www. (78.129.159.37) 56(84) bytes of data. A ping to the server is timed at 1125 ms.